Will the 200 day moving average finally give way? MMM is attempting to put some distance on this extremely heavy resistance area. The declining 200D has capped the last five monthly highs. 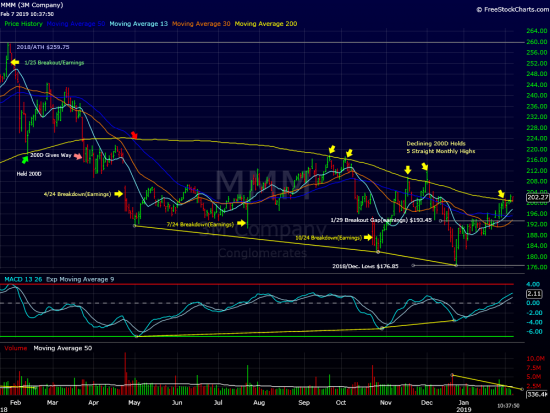 MMM has not closed consecutive days above the 200D since March of last year. Maybe today? MMM reported solid Q4 earnings on January 29th. The stock opened the day with an upside gap and has been trading above that gap since. We believe 3M is on the verge of a fresh rally leg and is a fairly low risk buy near current levels. On the downside, a close back below $196.00 would violate this week’s low signally the 200D is still in control. At time of publication we do not have a position in MMM.